Princess Rockstar theme party is the trend these days for your little princesses. Why not? They can dress up wearing their boots, rubber shoes, wrapped or chunky leather bracelets, tutus, leather jackets and more. The venue will blast with top tc electronic sound system, colorful lights and a lot of dancing and singing.Kids will really enjoy that kind of party theme. 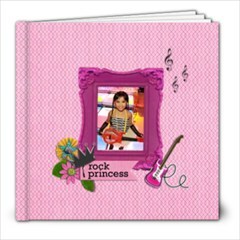 Here's a Rockstar Princess Photobook Template that I made and it's available for FREE to use at ARTSCOW. It's available in 8x8 sizes in regular and deluxe print. Pages are from 20, 30 and 39 pages.